Whew! I have no idea where March has gone, somehow swallowed in family, flare-ups, knitting, and future plotting. Spring was officially welcomed with a return to wintry temperatures and fresh snow, which I have to admit I just love. When I open my blinds in the morning, I’m always secretly wishing for that specially overcast sky that snow brings with it. I’m impressed with the songbirds, who go about their business even as the temperatures drop, and the robins are back. Just yesterday, I noticed some tiny purple flowers pushing up in the grass beside the sidewalk, so spring is continuing to arrive. It can take all of the time it pleases. It’s the polar opposite of south Texan springs, which race headlong into summer, much to my chagrin, since spring is glorious there and by far my favourite Texan season. My mother gleefully reports it’s already hitting eighty degrees. My trip to D.C. and NYC is suddenly less than two weeks away! Once again, if you have any tips (I’ll be focusing on Manhattan in NYC and the classic tourist areas of DC) for favourite budget restaurants, cafes, bookstores, quirky museums, photo walks, or anything else, I’ll gratefully receive them. And meet ups are a distinct possibility as well (a group of us are already plotting one for DC)! I’m terrible at remembering who lives where, so I’d appreciate any reminder e-mails (astripedarmchairATgmailDOTcom). After I get home, I have yet another plan, although this one is of a distinctly homebody nature. I’ve decided, after four happy years with Thistle (March 18th is my dog-iversary), that it’s time to expand my little household. And the expansion shall go in a feline direction. Thus I’d welcome any tips from cat owners too! I’ve begun doing lots of reading, and have so far absorbed that cat ownership is nothing like dog ownership, so it will be great fun to get to know another species better. Let’s just hope Thistle agrees…she has a certain feline nap buddy over at Debi’s, which gives me more confidence. I met the cat for the first time yesterday; her foster mom brought her over to the apartment, and at the end of our hour-long meeting, she had already decided that my place was a perfect place to curl up and receive some chin scratches. Of course, it took far less than an hour for her sweet, delicate, but confident ways to win me over! She’s four years old, so we’ll be jumping right over the tricky kitten and adolescent stages, and I know her personality’s already settled. Here are a couple of photos (take with my phone, not my real camera, so not the best quality): I took the first one, up top, and she became curious about the noise the phone’s shutter made, as shown in the next photo below. So precious! You can’t see it here, but her eyes are a soft, luminous blue. I’ll make the proper introductions once she’s settled in, but I’ve already chosen a name, and it continues the nature theme. I haven’t posted about Once Upon a Time challenge yet, now on its ninth year, but I’ve been on a magical realism kick & plan to ramp up my fairy tale and fantasy reading in honour of it. The very first version, back in 2007, was one of the first reading challenges I did as a baby book blogger! That and Carl’s fall challenge are still my two favourites. Hopefully I’ll manage to get a book list up before I leave, although between trip planning and trying to finish knitting one more spring-like beret for said trip and cat behavior researching and cat accessory shopping (yes, my cat will have her own piece of furniture, in addition to all of mine), I’m going to be disturbingly busy. And book list posts take ages, with all of the links and covers and annotations; luckily they’re fun! As I’m short on time today, rather than talk about all of the books I’ve been reading, I’ll just do the magical realist ones. They’d both be perfect ways to dip your toes into fantasy, as they also have ‘literary’ qualities and deal with ‘real people’ living ‘real lives’ which are suddenly brushed by what could or could not be magic. And they’re both wonderful, compulsively readable books! 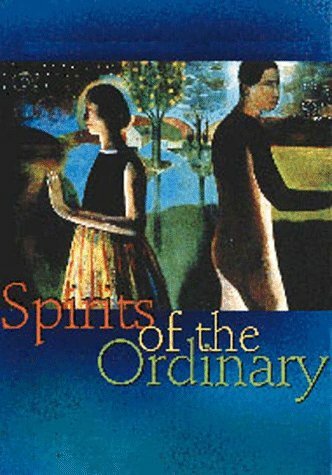 First is Spirits of the Ordinary by Kathleen Alcala. Magical realism is often associated with Latin American authors, and Alacala is a Mexican-American writer. This book is set in northern Mexico/southern Texas, in the late 19th century, and combines all of my favourite aspects of Latino magical realism with a feminist sensibility, in the sense that “feminism is the radical notion that women are people” (that marvelous phrase was coined by Marie Shear, according to a quick internet search). Let’s face it, there are some South American authors I could name who don’t seem to have realised this yet. Anyway, Spirits of the Ordinary centers around a family in the small village of Saltillo. Zacarias, the husband, comes from a hidden Jewish tradition (being a Spanish colony, Mexico had its own Inquisition and forced conversion of Jews) and feels irresistably drawn to the desert, abandoning his family to wander in search of gold for months at a time. Estela, his wife, is tired of not having a dependable partner to depend on; when Zacarias leaves again, taking yet more of her dowry money, she takes the radical step of severing their finances, essentially becoming a single mother. We follow both of their journeys, as they change and grow over the next few years, and we also get to intimately know other members of their family, from Zacarias’ mother, mute since a teenage coma during which angels spoke to her, to Estela’s younger twin siblings, a brother/sister pair who refuse to fall in line with societal gender roles. This is magical realism at its very finest, and I can’t imagine anyone not enjoying it. 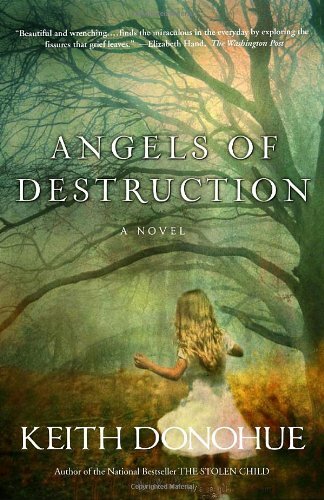 I noticed Angels of Destruction by Keith Donahue on the shelf and became very excited; I read his debut novel, The Stolen Child, which is all about changelings, not long after it came out and loved it. I didn’t realise he’d written another one! This one also has an unusual child at the center, one who may or may not be an angel in disguise, as well as an exploration of mother/daughter relationships, identity, faith (in people, fate, God, etc.) and how we can get caught up in events without really noticing that will change our lives. I was hooked from the first page, and effortlessly fell in love with all of the women and girls at the heart of the book. Very occasionally Donahue makes a gender binary ‘common wisdom’-esque pronouncement that annoyed me, but I think it happened 2-3 times, and it didn’t detract from the many kinds of women and positive relationships between them that he portrays. His writing style is a bit folksy, so those pronouncements were likely a stylistic device more than anything. She heard the fist tap again, tentative and small. Margaret pressed her palms against the oak to deduce the presence on the other side, without seeing, without being seen, and on faith undid the locks and swung wide the door. Don’t you want to know who was waiting for her on the other side? There’s nothing I love more than a book that combines thoughtful themes with compelling characters and beautiful writing: Angels of Destruction does this. Keith Donahue has written two more books as well, and I’ll be reading them sooner rather than later. I apologise for taking so long to reply to comments on my last post. I hope to do that later today or tomorrow, but right now I must get Thistle outside for her morning walk. I hope you all are well, and that no one gets too pranked on April Fool’s! Oh- a kitty! I love sharing home with a cat. Yes, very different from dogs, but so companionable as well. I did so like Donahue’s first book and like you, hadn’t realized he wrote more. This one actually doesn’t sound so appealing to me, but I will look for the others! Is it the angels that are turning you off? I’m not usually big on angels either, but these were well done (aka not like Touched by an Angel or a Hallmark movie). But as you say, there are two others for you to choose from! Congratulations! Your newest furry is enchanting. And, thanks for Angels of Destruction. Can’t wait to read it. What a beautiful little kitty! Love her “mask” on her face (sort of looks like a mask). Yes, spring in Texas is the best. The bluebonnets and other wildflowers have just exploded this last week. They are everywhere. Sigh. I love it. And, yes, the temps are heading up, but I am going to enjoy every little bit of spring we have. Hope your trip is wonderful. I love visiting the sites in Washington. I could live at the Smithsonian, I think. Take care! Oh the bluebonnets! I got a big print made from a photo I took of the bluebonnet field near my house & have it on my living room wall now. *sigh* Next year I might go home for my birthday: enjoy your Texan spring! Yep, the cat is part Siamese, so she’s got that Siamese mask and the ‘tipping’ on her tail & ears. I actually did a bit of internet research, because I was so intrigued by her colouring, and it turns out she’s a ‘chocolate tortoiseshell point,’ except of course she’s not pure Siamese. I was surprised to discover how complex & fascinating the genetics of cat coat colour are! What a beautiful cat! I am a cat owner myself, adopted mine when she was maybe 2 years old. Figuring out food can take a while – pickiness plus my cat is allergic to anything with gluten in it. Since I have a small apartment with no real out of the way place for the litter box, I got a top-entry kind so that if she kicks around the litter, it’s not all over the floor. Eek to food allergies! Luckily, my foster mom said she’ll eat any kind of food, especially canned food (which I plan to mainly feed her for the health benefits), so hopefully that’ll go well. But my mom’s cat is an incredibly finicky eater, so I know how tricky that can be. What a good idea about the litter box! I’m lucky in that my little studio has a generous walk-in closet, so I can tuck the box away in there. There’s no door though, so I’ll have to be very quick about cleaning it to keep the apartment smell-free! Cute kitty! We went in the opposite direction and got two cats and then a dog. Cats are… Interesting. They are capable of listening, but they don’t always do so! Good luck! I can’t comment on the relationship between cats and dogs because my dog is a puppy and hyper. Also, Mackie eats litter… So… lol I got Casey (gray kitty) as basically a kitten, but Finn (orange kitty) is older. I chose that to avoid the kitten phase. haha. I had planned to do that with dog ownership, too, but Mackie just kind of happened! Kelly, that definitely seems to sum up cat behavior. lol I definitely wanted to jump right over the kitten phase! And I’m very lucky: Thistle has no interest in litter boxes. Instead, she just tries to steal the cat food straight out of the bowl, which feels like a far easier behavioral challenge. Good luck with training Mackie to keep out of the box! Love the cat. So pretty. I have 2 indoor cats and 3 dogs and they usually get along okay. It’s good for the cats to have their own perch or place when they tire of the dogs that the dogs can’t reach. Lots of attention to both so you don’t get the green eyed monster. I look forward to hearing how it goes and have lots of fun in DC and New York. I look forward to cat-introduction posts in future! Thank you Becca! So many fun suggestions & I love Ethiopian food. :D …and empanadas…yum! Let me know if you plan a return visit to DC; I have family in the area who I can stay with, so it’d be pretty cheap for me to take the train down & do a blogger meet up! I’ll second that recommendation of the Freer Gallery. It’s usually quite uncrowded and it’s filled with beautiful things (I particularly love the Peacock Room though it’s not to everyone’s taste). I’ll add Hillwood (Marjorie Meriwether Post’s former home) if you have any interest in decorative arts. In New York, I’ll recommend the Lower East Side Tenement Museum. It’s so well done and I’ve never been anywhere quite like it. Favorite bookstores in NYC: The Strand, of course, and Housing Works (both in Manhattan). Have a wonderful trip! Mlle. Kitty is beautiful, and I can’t wait to have a proper introduction to her! I am not the world’s greatest recommender of things in Manhattan (I’m better at Brooklyn), but I am — as I’ve said — crushed that I’m no longer in NYC to come hang out with you. One day! Oh, you know what I do love in Manhattan? There is a tea shop called Bosie in the West Village that serves the most heavenly scones with jam and clotted cream. Presumably their tea is also good — it is certainly varied — but I am not a tea drinker. On days when I felt I deserved a little luxury, though, I would go to Bosie for coffee and scones. I cherish those days, and I always go back there when I’m in town. It’s also fantastic for eavesdropping on other patrons, if that’s your jam (it is mine). What a beautiful cat! My family has always had cats, mostly outside until recently. They’re so mischievous. I hope you are blessed by the new addition to your home! Thank you! I think I will be; I love adopting adult pets who have been fostered, because you know so much about their personalities beforehand, which lets you choose just the right one!